The Technology sector has had a tough few weeks and frankly it’s been long overdue, but with the recent stock market correction, one sector we thought would get a bid in rockier seas, and hasn’t, is Consumer Stables. The Consumer Staples sector is roughly 7.5% of the SP 500 by market cap. (Be sure and click on the spreadsheet for a closer look). Staples ranks 6th of the 11 SP 500 sectors when ranked by market cap as a percentage of the SP 500. This blog’s November ’17 post actually gave some insight as to why the sector was performing so poorly and in fact, despite the recent market turmoil, the top stocks in the XLP (Consumer Staples ETF) didnt get much of a bounce. Procter & Gamble (PG): down 16% year-to-date, and is very oversold but even the Nelson Peltz proxy fight hasn’t helped the consumer brand giant. 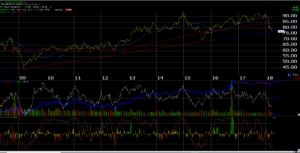 The stock is sitting right on its trendline off the 2009 low, so PG is at a doe-or-die moment. Coca-Cola: (KO) a long-term client holding down 6% year-to-date and is also trying to hold the lower end of a trading range between the low $40’s and $47 per share. New CEO, new restructuring, new a lot of things, but same old Coke, and still long for clients. Only major holding from the sector besides XLP. Pepsi (PEP): down 9% YTD – never done any fundamental work on PEP thus little commentary for readers. Philip Morris Int’l: (PM) – -6% YTD, never owned, no interest. WalMart (WMT): -11% YTD, being disrupted by Amazon – Whole Foods. The XLP itself is down 9% YTD as of Thursday, March 22, 2018. Coca-Cola is a 1.5% position in client accounts, looking across the total assets, but I’ve been waiting for the breakout above the July – August, 1998 high for KO. The stock has been out of favor for 20 years and with a new CEO, restructuring, a move to “asset-lite” with expected higher returns and a less capital intensive business, we’ll see if Jim Quincey has the stuff to reinvigorate KO. The last element that has been surprising about KO and Consumer Staples, is that the dollar has been relatively weaker the last 4 – 5 months, thus with the recent market turmoil, readers have a second reason to own the sector. Fundamentally, Staples have always been about consistency and dependability of earnings and revenue growth, and “recession-proof” but still pricier products, and I wonder if that price premium demanded by Pampers and cigarettes, and such is starting to fade. Heck, WalMart was Amazon before Amazon (every-day low price), but even they continue to struggle. We’ll see how next week goes in terms of the quarter-end stock market rally, but the “defensive” Consumer Staples sector hasn’t been so defensive. Assume the XLP will be sold at some point without a decent bounce. Coke will likely remain a longer-term hold – Quincey deserves another quarter or two at least.